This textbook provides students with basic knowledge of stochastic models that may apply to telecommunications research areas, such as traffic modelling, resource provisioning and traffic management. 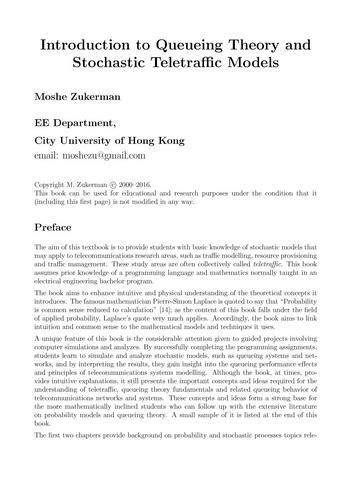 Moshe Zukerman wrote:The aim of this textbook is to provide students with basic knowledge of stochastic models that may apply to telecommunications research areas, such as traffic modelling, resource provisioning and traffic management. These study areas are often collectively called teletraffic. This book assumes prior knowledge of a programming language and mathematics normally taught in an electrical engineering bachelor program. The book aims to enhance intuitive and physical understanding of the theoretical concepts it introduces. The famous mathematician Pierre-Simon Laplace is quoted to say that "Probability is common sense reduced to calculation" ; as the content of this book falls under the field of applied probability, Laplace’s quote very much applies. Accordingly, the book aims to link intuition and common sense to the mathematical models and techniques it uses. Professor Moshe Zukerman received his B.Sc. in Industrial Engineering and Management and his M.Sc. in Operation Research from Technion - Israel Institute of Technology and a Ph.D. degree in Engineering from The University of California Los Angeles in 1985. Since December 2008 he has been with the Electronic Engineering Department of City University of Hong Kong and as a Chair Professor of Information Engineering and a team leader.